I have another Lilypad Lake card to share with you. I hope you’re not getting tired of this set. I fee like I’m just getting started with it! Check out the vibrant colors on this card. I wish I could say this was my original idea, but I’m afraid it is just my version of another card I saw. Isn’t it lovely? It’s so pretty and peaceful. Thank you for taking the time to come by and visit today. I hope you are ready to have a great weekend! 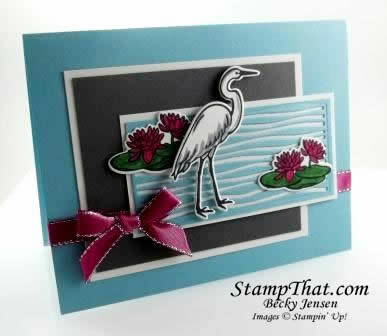 Your “Another Lilypad Lake Card ” is very well done in the vibrant colors that you used. I am not tired of seeing the selection that you have been sharing with us, it just makes me want to pack a picnic lunch and spend the day relaxing and watching the wildlife. Picnic’s are always fun and relaxing. I hope you and your Family have a great weekend together.